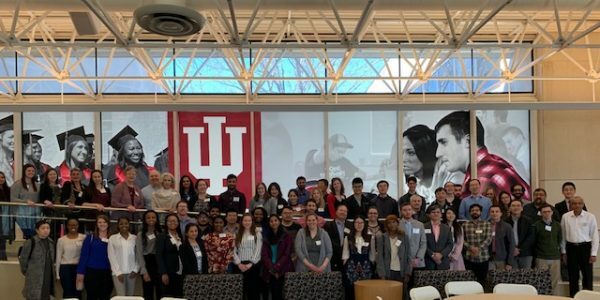 On Saturday, March 23, 2019, the Amelia Project 16th Annual Meeting was held at Indiana University-Kokomo. The Catherine Peachey Fund of the Heroes Foundation was once again the sponsor for this unique event, bringing together nearly 100 Indiana breast cancer researchers, physicians, patient advocates and, for the first time, representatives from the pharmaceutical industry. The hallmark of this meeting is collaboration. Breast cancer researchers from the University of Notre Dame, Purdue University, Indiana University-Bloomington and Indiana University-Purdue University at Indianapolis came together to present their research and to learn from one another. “It is a thrill to watch these great minds furiously taking notes, asking questions of their colleagues, complementing each other on their research and presentations, and discovering ways that they can share research information and resources,” Stephanie Lesher, Program Director for the Catherine Peachey Fund, said. An exciting new component to this year’s Amelia Project was the attendance of representatives from Pfizer and Novartis. Industry and academia recognize that working together and collaborating on breast cancer research is in the best interest of both parties and, more importantly, in the best interest of patients. We are excited to help grow this new component of the meeting as we look toward the Amelia Project 2020! For more information on the Amelia Project, please contact Stephanie at slesher@heroesfoundation.org.